A Weather Pack connector is manufactured of nylon plastic and has silicone seals to prevent moisture and dust ingress. 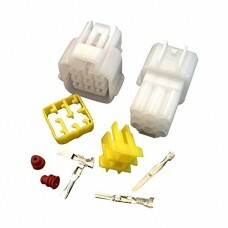 Weather pack connectors ensure secure connectivity as each connector has a locking mechanism that align the terminal and seal, and acts as a strain relief for the terminals. Use weather packs for automotive, marine, agricultural and other harsh environmental applications. The weather pack was designed for the engine compartment of a vehicle. Positive snap-action locking. Secondary locking helps terminal retention and provides access to the terminals for service. Stops in all cavities to insure proper insertion of terminals. All connectors indexed to prevent mis-mating. Male terminals connect with "shroud (male)" housings and female terminals connect with "tower (female)" housings.